Francis Albert Sinatra (December 12, 1915 – May 14, 1998) was a jazz oriented popular singer and Academy Award-winning actor. Beginning his musical career in the swing era with Harry James and Tommy Dorsey, Sinatra became a solo artist with great success in the early to mid 1940s, finding fame as the first of America's "teen idols." His professional career had stalled by the 1950s, but it was reborn in 1953, after he won the Academy Award for Best Supporting Actor for his performance in From Here to Eternity. He then signed with Capitol Records, and released several critically lauded albums (such as In the Wee Small Hours, Songs For Swingin' Lovers, Come Fly With Me, Only the Lonely, and Nice 'n' Easy), as well as many hit singles. Sinatra left Capitol to found his own record label, Reprise Records. He toured internationally and fraternized with the Rat Pack and President John F. Kennedy in the early 1960s. Through much of his career, he also faced controversy over his alleged connection with organized crime. He turned 50 in 1965, recorded the retrospective September of My Years, and scored hits with Strangers in the Night and My Way. Facing dwindling album sales and several poorly received films, Sinatra retired in 1971. However, in 1973, he recorded several albums, scoring a hit with New York, New York. After this, he toured and performed for large audiences both within the United States and internationally, until a few years before his death in 1998. 3 The Columbia years and "The Voice"
Sinatra had three children; Nancy, Frank Jr., and Tina, by his first wife Nancy Barbato. He married three more times, to the actresses Ava Gardner and Mia Farrow, and finally to Barbara Marx, to whom he remained married until his death. He is considered by many to be the greatest American pop singer of the twentieth century. Frank Sinatra at his New Jersey Draft Board. Francis Albert Sinatra was born in Hoboken, New Jersey. He was the only child of a quiet Sicilian fireman, Anthony Martin Sinatra (1894-1969). Anthony had emigrated to the United States in 1895. His mother, Natalie Dolly Garavanta (1896-1977), was a talented, tempestuous Ligurian, who worked as a midwife, Democratic party ward boss, and was reportedly a part-time abortionist. The home Sinatra was raised in, especially after the age of five, was comfortably middle-class even as the surrounding neighborhood tipped toward lower middle class. Following his teen years in New Jersey, Sinatra was interested in serving his country during World War II. But on December 9, 1941, close to his twenty-sixth birthday, he was classified as 4-F at Newark Induction Center, due to a punctured eardrum he had suffered from a difficult forceps delivery. This allowed him to pursue entertainment, rather than being enlisted in the Army Air Corps. In September 1935, Sinatra appeared on the Major Bowes Amateur Hour as part a group called the Hoboken Four. The group won the show's talent contest with a record 40,000 votes, which led to a national tour with Bowes. Sinatra then took a job as a singing waiter and MC at the Rustic Cabin in Englewood, NJ. In 1939, the wife of band leader and trumpet player Harry James heard Sinatra on the radio. James, whom Sinatra had been trying to contact via letters, hired Sinatra on a salary of $75.00 a week and the two recorded together for the first time on July 13, 1939. Although the Harry James Orchestra never met with huge success, it was generally well received, and Sinatra, who recorded ten songs with the group, gained a great deal of experience. At the end of the year he left James to join the Tommy Dorsey Orchestra, where he rose to fame as a ballad singer. His first and biggest hit with the band was 1940's "I'll Never Smile Again," which spent several weeks at number one—and was the first "number one"—on Billboard magazine's new chart of America's top-selling records. His vast appeal to the "bobby soxers," as teenage girls were called, revealed a whole new audience for popular music, which had appealed mainly to adults up to that time. On record, Sinatra cut 29 singles with Dorsey during 1941 and was named Male Vocalist of the Year by Billboard that May. His departure from the Dorsey band was announced on stage at the Circle Theatre in Indianapolis, on August 28, 1942. The Columbia years and "The Voice"
In 1943, he signed with Columbia Records as a solo artist with initially great success, particularly during the musicians' recording strikes. Vocalists were not part of the musician union and were allowed to record during the ban by using a cappella vocal backing. Sinatra scored several hits during the strike, then enjoyed one of his biggest hits when the strike ended with "Saturday Night Is the Loneliest Night of the Week." Teenage fans wait for Frank Sinatra to arrive at the Paramount Theater, New York. He also starred on radio programs during this period and was widely considered the nation's second-most-popular singer, behind Bing Crosby, whose attendance/box office records at the New York Paramount Sinatra shattered in December 1942, when a two-week engagement was extended to eight. It was during these shows that the so-called "Bobby-soxers," Sinatra's teenage female fans, began to create a deafening roar, the likes of which had never been heard before, when Sinatra was on stage. "Sinatra-mania" was now, officially, in full swing as he landed no less than 23 top ten singles on Billboard between 1940 and early 1943 and became affectionately known as "The Voice." In 1944, Sinatra started his film career, signing a seven-year contract with RKO and appearing in light-musical vehicles such as Step Lively and Higher and Higher, which catered to Sinatra's teenage fans. He was soon noticed by movie executive Louis B. Mayer, who bought his contract from RKO and upped his salary from $25,000 to $130,000 per film under a $1.5 million contract with MGM. In 1945, Sinatra co-starred with Gene Kelly in Anchors Aweigh. A major success, this set the standard for subsequent Kelly/Sinatra pictures. That same year he was loaned out to RKO to star in a short film titled The House I Live In. Directed by Melvin LeRoy, this film promoted tolerance and racial equality and earned a special Academy Award. Sinatra was photographed getting fingerprinted while applying for a gun permit in 1947. By 1946, Sinatra was performing 45 shows a week during some months. That year saw the release of his first concept album, The Voice of Frank Sinatra, and the debut of his own weekly radio show. On screen, he appeared at the finale of Till the Clouds Roll By singing Ol' Man River and starred in the well-received It Happened in Brooklyn. The down-side of fame for Sinatra was a series of public relations gaffes that tarnished his name and his image. Many saw him as a womanizer and a would-be thug. Critic Lee Mortimer felt the brunt of Sinatra's temper in a Hollywood club when the singer struck him after Motimer had criticized Sinatra's performance in It Happened in Brooklyn, a film that was otherwise well received. Later, comedian Don Rickles, seeing Sinatra in a nightclub audience, invited the singer to feel free to make himself at home and "slug somebody." By the end of 1948, Sinatra himself felt that his career was stalling, and he slipped to No. 5 on Down Beat's annual poll of most popular singers. With record sales also falling, Sinatra tried a new musical approach, recording gospel songs and novelty tracks. However, Sinatra never abandoned quality material, and would still record brilliant interpretations of Autumn in New York, Body and Soul, Laura, and numerous standards besides. The year 1949 saw a change for the better, as Frank teamed up with Gene Kelly again to co-star in Take Me Out to the Ball Game. Directed by Busby Berkley and with strong support from Jules Munshin, Betty Garrett, and Esther Williams, the movie was well-received critically and became a major commercial success, becoming the eleventh highest earning film of the year. That same year Sinatra would team up with Kelly once again in On the Town. Hailed a classic of the genre, the film was groundbreaking for its location shooting—something unheard of at the time for a musical—in New York City. By the end of 1949 alone, On the Town would earn over $3 million, becoming the seventeenth biggest earning film of the year, becoming one of the great musicals of Hollywood's "Golden Era." On October 7, 1950, The Frank Sinatra Show premiered on CBS. This Saturday-night show was broadcast weekly from 9:00 p.m. to 10:00 p.m., leading to a radio series, also on CBS, called Meet Frank Sinatra. A second series of The Frank Sinatra Show premiered on October 1, 1952, but ratings were dwarfed by the likes of The Milton Berle Show. Sinatra's career continued to decline as novelty tunes became popular with audiences, and as he moved into his mid-thirties, his potential appeal to new teenage audiences declined. Sinatra did have some hits during this time—Birth of the Blues, Goodnight Irene, Castle Rock, Bim Bam Baby, Mama Will Bark—and he continued to work on stage, television, and radio. In September 1951, Sinatra made his Las Vegas debut at the Desert Inn. By 1952, However, he was at his lowest ebb. Double Dynamite, a movie vehicle with Jane Russell and Groucho Marx, was both a critical and commercial failure. He was paid only a $25,000 fee for the film Meet Danny Wilson, in which he played a nightclub singer under the influence of the Mafia. Neither movie proved popular. 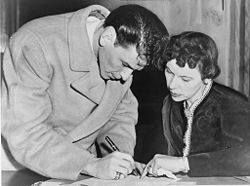 Between March 26 and April 8, 1952, Sinatra was back on stage at the Paramount Theater in New York, playing to much smaller crowds than in the days of the rioting Bobby-soxers, while a British tour in 1953 was met with a middling response. After several more failures on records, the screen, and the stage, both Columbia and MCA dropped Sinatra in 1952. The rebirth of Sinatra's career began when he played Pvt. Angelo Maggio in the eve-of-Pearl Harbor drama From Here to Eternity (1953), for which he won an Academy Award for Best Supporting Actor. This role and performance have become legendary, and he went from being lost in a critical and commercial wilderness for several years to being an Oscar-winning actor and, once again, one of the top recordings artists in the world. In 1953, Sinatra signed with Capitol Records, where he worked with many of the finest musical arrangers of the era, most notably Nelson Riddle, Gordon Jenkins, and Billy May. Sinatra reinvented himself with a series of albums featuring darker emotional material, starting with In the Wee Small Hours (1953), and followed by Frank Sinatra Sings For Only The Lonely (1958) and Where Are You? (1957). He also developed a "hipper" persona, as heard on Swing Easy! (1954), Songs For Swingin' Lovers (1956), and Come Fly With Me (1957). Back on the big screen, Sinatra won rave reviews for a seething performance as an assassin determined to kill the President of the United States in the thriller Suddenly. "Young at Heart"—the song that could be considered as his "comeback" single—peaked on the Billboard charts at number two and would become the title of a Sinatra/Doris Day film. By the end of the year, Billboard named "Young at Heart" Song of the Year. Swing Easy!, his second album for Capitol, was named Album of the Year, and Sinatra was dubbed "Top Male Vocalist" by Billboard, Down Beat, and Metronome. The following year Sinatra would win a starring role alongside Robert Mitchum and Olivia DeHavilland in the much anticipated screen adaptation of Morton Thompson's best-selling novel Not as a Stranger. Lighter fare would follow in the shape of The Tender Trap, a romantic musical with Debbie Reynolds. Sinatra also co-starred with Marlon Brando in the hugely popular and successful Guys and Dolls, which was the highest grossing film of 1955. Released in 1955, Sinatra's first 12-inch LP In the Wee Small Hours was also his first collaboration with Nelson Riddle. Hailed as a masterpiece by critics, In the Wee Small Hours would set the standard for future Sinatra albums and signaled a huge leap forward for the concept album. It spent a record 18 weeks at number two on the Billboard album chart. One of the most sensational films of its day was Otto Preminger's The Man with the Golden Arm (1955) and here, in the lead-role as reformed heroin addict Frankie Machine, Sinatra gave arguably his best and most widely acclaimed performance. Groundbreaking for its depiction of drug addition, bucking Hollywood's production codes, and for a thrilling jazz score courtesy of Elmer Bernstein, The Man With the Golden Arm would prove popular at the box office while Sinatra was nominated for an Academy Award for Best Actor at the 29th Academy Awards. In 1955, Sinatra starred in Our Town, a one-off TV drama based on the play by Thornton Wilder. Co-starring Eva Marie Saint and Paul Newman, Our Town was broadcast in color live on NBC and was well received, garnering positive reviews, strong ratings, and an Emmy Award for the song "Love and Marriage." Sinatra performed often in Las Vegas, especially at the Sands Hotel in which he owned a substantial share. During this time Sinatra would also begin to explore several business ventures that would prove lucrative for him over the years. An acquisition of a percentage in the Sands Hotel in Las Vegas led him to perform exclusively there, while in 1956, he produced his first film, the psychological western Johnny Concho. In 1957, Sinatra gave one of his finest on-screen performances in The Joker Is Wild, a biopic of nightclub singer Joe E. Lewis, whose throat was cut by the mob, forcing him to find a new career as a stand-up comic. Sinatra's starred with Rita Hayworth and—for a second time—Kim Novak in his next film Pal Joey. Based on the play by Richard Rogers and Lorenz Hart and once thought too risque for Hollywood, critics hailed Pal Joey as a definitive Sinatra vehicle. Sinatra won the Golden Globe for Best Actor in a Musical or Comedy for his role as Joey Evans, although this is one of the few post—From Here to Eternity movies in which Sinatra didn't top the bill. The album Come Fly With Me (1958) took several years to come to fruition, but when Sinatra and Billy May finally collaborated on this travelogue-style concept album, the results were outstanding. A number one album for five weeks on Billboard, Come Fly With Me remains one of the defining Sinatra albums. The mood would change dramatically, however, for Sinatra's second album of 1958, Frank Sinatra Sings for Only the Lonely. A stark collection of introspective saloon songs and blues-tinged ballads, this album contained some of the most lauded recordings of Sinatra's career and in many ways could be considered the apex of the Sinatra/Riddle collaborations. Only the Lonely was a mammoth commercial success, peaking at number one on Billboard's album chart during a 120-week stay, while cuts from this LP such as "Angel Eyes" and "One for My Baby (and One More for the Road)" would remains staples of Sinatra's concerts until the very end. In November 1957, the New York Times estimated that Frank Sinatra's annual income was $4 million, while he had proven himself to be the most consistent album-seller in the U.S, shifting, on average, 200,000 copies of each release. In July 1958, Sinatra sang at a benefit in Monte Carlo. Princess Grace was in attendance and, on this night, Sinatra worked for the first time with Quincy Jones. Their working relationship would last until the 1980s, and their friendship until the end of Sinatra's life. After the serious tone of the much lauded Frank Sinatra Sings for Only the Lonely Sinatra was back in the recording studio to cut a more buoyant album during December of 1958. The result was the multi-Grammy Award winning album Come Dance With Me. A massive success, the album's title-track would win Best Male Pop Vocal Performance at the 1960 Grammy Awards, while the album itself would be named Album of the Year on Billboard. Come Dance With Me would peak at number two during a 140 week chart-run, and in the UK it would reach the same position during a 30-week stay. Between 1955 and 1959, Sinatra spent more weeks than anyone else on Billboard's album chart—450 weeks in total—reaching the top-ten no less than 14 times and ten of his singles reaching the top 20. In the UK, Sinatra was just as successful, reaching the album top-ten 14 times between 1956 and 1959, scoring four number ones in the process. Songs For Swingin' Lovers (1956) proved so popular that its sales registered on the singles chart, becoming the only album to rank among the UK's top-20 singles, as well as becoming the first UK number one album, on July 28, 1956. 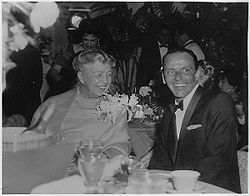 Sinatra, pictured here with Eleanor Roosevelt, at Girl's Town Ball in Florida, March 12, 1960, was an ardent supporter of the Democratic Party until 1968. Sinatra would start the 60s as he ended the 50s, his first album of the decade, Nice 'n' Easy, topping Billboard's album chart and winning critical plaudits en masse, this, despite Sinatra's growing discontented at Capitol Records and having decided to form his own label, Reprise Records. His first album on the label, Ring-A-Ding-Ding (1961), was a major success, peaking at number four on Billboard and number eight in the UK. During this time, Sinatra was highly prolific on the album charts, placing eight albums among Billboard's top ten over the course of 1960 and 1961 alone, a feat repeated in the UK. On May 29, 1960, Sinatra played his first shows in Japan, where he was extremely popular and would return several times over the coming decades, giving his final public performance at the Fukuoka Dome in 1994. Sinatra was also reaching the heights of the American social order, associating with such luminaries as Eleanor Roosevelt and the Kennedy Brothers. Sinatra's Mafia associations were also becoming infamous. He reportedly acted as a liaison for the Kennedy family and the Giancana Mafia organization during the 1950 presidential campaign, helping to gain votes for Kennedy. After the election, however, the Kennedy administration launched its war on organized crime and soon disassociated itself from Sinatra. Sinatra's first [released] movie of the 1960s was the all-star vehicle Can-Can. Featuring Louis Jourdan, Maurice Chevalier, Shirley MacLaine, and Juliet Prowse, the film was a major commercial success—especially after Soviet Premier Nikita Krushchev visited the set in September of 1959, and lambasted the production as being an example of "western decadence"—while the accompanying album won the Grammy Award for Best Motion Picture Soundtrack. Sinatra (left) with Peter Lawford and U.S. Attorney General Robert Kennedy, in Los Angeles. Following hot on the heels of Can Can was Ocean's 11, the film that would become the definitive on-screen outing for The Rat Pack. A major success commercially, if hardly an artistic triumph, Ocean's 11 was the ninth most successful film of 1960, with over $5.5 million taken in domestic rentals. In 1962, Sinatra and Count Basie collaborated for the album Sinatra-Basie. This popular and successful release would prompt them to rejoin two years later for a follow-up It Might As Well Be Swing, which was arranged by Quincy Jones. One of Sinatra's more ambitious albums from the mid-sixties was The Concert Sinatra, which was recorded with a 73-piece symphony orchestra on 35 mm tape. As Reprise Records flourished and Sinatra's artistic vision widened further, not to mention his commercial success remaining at a peak without falter for almost a decade solid by this time, he embarked upon a project that would boost the talent of the record label he started and owned: The Reprise Musical Repertory Theater. Produced by Sinatra himself, complete scores from four lauded Broadway musicals were commissioned and a wealth of talent recruited for the recordings. In 1962, Sinatra resumed his strong film work in John Frankenheimer's classic thriller The Manchurian Candidate. Here Sinatra gave one of his finest acting performances, playing the disturbed Major Bennett Marco. Widely hailed as a masterpiece, The Manchurian Candidate featured career-best performances from both Laurence Harvey and Angela Lansbury and is listed in the American Film Institute's 100 Greatest Films. In 1965, Sinatra made his directorial debut with the anti-war film None But The Brave. This, the first Japanese/American co-production (Warner Bros./Toho Studios), opened to good reviews and good box office receipts in both America and Japan. Von Ryan's Express  was more action based—almost like the Saturday morning adventure serials of the 1940s and 1950s—teaming Sinatra up with Trevor Howard in a thrilling escapade that became a major box-office success, grossing $17 million. Sinatra's first live album, Sinatra at the Sands, was recorded during October and November 1966, at the Sands Hotel and Casino in Las Vegas. Backed by the Count Basie Band, with Quincy Jones serving as arranger, Sinatra at the Sands was released in August 1966, reaching number seven in the UK and number nine on Billboard. In June 1965, Sinatra, along with Sammy Davis, Jr. and Dean Martin, played live in St. Louis to benefit Dismas House. The concert was beamed live via satellite to numerous movie theaters across America. Released in August 1965 was the Grammy Award winning album of the year September of My Years, while a career anthology, A Man and His Music, followed in November, itself winning album of the year at the Grammys in 1966. In 1965, the compilations Sinatra '65: The Singer Today and My Kind of Broadway were also released, while the TV special Sinatra: A Man and His Music garnered both an Emmy award and a Peabody Award. On July 24, Sinatra headlined the Newport Jazz Festival, playing to a standing-room-only audience. In early 1966, the album Moonlight Sinatra appeared, followed in the spring by That's Life, both the single and album would achieve considerable success in the United States—both were top-ten hits on Billboard's pop charts—before "Strangers in the Night" went on to top the Billboard and UK pop singles charts on its way to winning the award for Record of the Year at the Grammys. After an extended run at Caesar's Palace during May 1969, Sinatra would play at the same venue the same night Nancy Sinatra played at the Hilton and Frank Sinatra, Jr. played at the Frontier. The press dubbed this The Night of 1000 Sinatras. With Frank Sinatra in mind, young singer-songwriter Paul Anka translated for Sinatra the song "My Way" from its French original Comme d'habitude, composed by Claude François and Jacques Revaux. "My Way" would, perhaps, become more identified with him than any other over his seven decades as a singer. Hailed as a fitting testament to a Singer who had indeed done it his way, "My Way" became instantly recognized as a signature of some status and was soon on its way to a peak position of number twenty-seven on Billboard's Hot 100. Sinatra arrives for a court appearance in Las Vegas in 1967 concerning tax reports of a casino with which Sinatra had been involved. Rumors had long existed that Sinatra was involved in organized crime, and in 1967 he had been involved in a court case involving tax irregularities at a Nevada casino operation. In 1970, Sinatra testified in front of the New Jersey State Commission on organized crime. Sinatra's appearance had come amid much acrimony. Sinatra declined to answer a subpoena, and subsequently sued the federal court, claiming that his subpoena was illegal. Sinatra's suit was dismissed, and he appealed all the way to the Supreme Court, who at four votes to three, found against him. However, on February 27, 1970, Sinatra sang at The White House as part of a tribute to senator Everett Dirksen. Over the summer Sinatra supported a Republican candidate for the first time, as he declared his support for Ronald Reagan in his race for the Governorship of California. He was also good friends with Vice-President Spiro Agnew. Sinatra said he agreed with the Republican Party on most positions, except that of abortion. In April 1971, Sinatra was awarded his third Academy Award, the Jean Hersholt Humanitarian Award, for his humanitarian and charitable efforts. On June 13, 1971—at a concert in Hollywood to raise money for the Motion Picture and TV Relief Fund—at the age of 55, Sinatra announced that he was retiring, bringing to an end his 36-year career in show business. Closing with the song "Angel Eyes," Sinatra exited the stage on the line "'scuse me while I disappear," not returning for an encore. In 1972, Sinatra hosted a Sunday-night television broadcast introducing the first home video game system, the Magnavox Odyssey. He was the first celebrity to promote a video game console. After a lifetime of supporting Democratic presidential candidates, Sinatra supported Richard Nixon for re-election in the 1972 U.S. presidential election. In 1973, Spiro Agnew resigned the vice presidency, amid charges of bribery, extortion, and tax-fraud charges; Sinatra helped Agnew pay some of his legal bills that mounted after his exit from office. During his years in retirement, Sinatra would still occasionally perform for various charities, while, on November 1, 1972, he was presented with the Lifetime Achievement Award from the Screen Actors Guild. In March 1973, he was named Man of the Year by the March of Dimes and on May 26, 1973, was named Entertainer of the Century by the Songwriters of America. In 1973—after receiving 30,000 requests asking him to at least record one final album—Sinatra came out of retirement with a television special and album, both entitled Ol' Blue Eyes Is Back. The album, arranged by Gordon Jenkins and Don Costa, was a great success, reaching number 13 on Billboard and number 12 in the U.K. The TV special was highlighted by a dramatic reading of Send in the Clowns and a song and dance sequence with former co-star Gene Kelly. In January 1974, Sinatra returned to Las Vegas, performing at Caesar's Palace. This, despite vowing in 1970 never to play Caesar's Palace again, after the manager of Caesar's, Sanford Waterman, had pulled a gun on him during a heated argument. With Waterman having been recently sacked, the door was open for Sinatra to return, and so hyped and highly anticipated were his shows that Elvis Presley's opening night at MGM's International was postponed because it clashed with Sinatra's show. From June 4 to 17, 1974, Sinatra toured the Far East, playing three shows in Tokyo and one concert aboard the USS Midway at the Yukosuka Naval Base. It was at this time when, during a break in Australia, Sinatra caused an uproar when he described the journalists there—who were pushing for a press conference—as "fags," "pimps," and "whores." Australian unions representing transport workers, waiters, and journalists all went on strike, demanding that Sinatra apologize for his remarks. In October 1974, Sinatra appeared at New York City's Madison Square Garden, in a televised concert that was later released as an album under the title The Main Event – Live. Backing him was band leader Woody Herman and the Young Thundering Herd, who accompanied Sinatra on a European tour later that month. The TV special would garner mostly positive reviews whilst the album—actually culled from various shows during his comeback tour—was only a moderate success, peaking at # 37 on Billboard and # 30 in the UK. In 1975, Sinatra embarked on his first world tour in 13 years. The tour proved so popular that he took out an advertisement in the Los Angeles Times stating: "It Was a Very Good Year. Countries 8, cities 30, attendance 483,261, performances 140, gross $7,817,473." In August 1975, Sinatra co-headlined with John Denver at Harrah's Lake Tahoe. An unprecedented 672,412 requests were made for tickets. In November 1975, he headlined at the London Palladium, where he had made his European debut in 1950. Some 350,000 requests were made for tickets, at the close of the year, Sinatra performed in front of 20,000 fans at the Chicago Stadium. 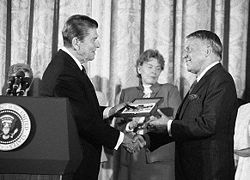 Sinatra receives the Presidential Medal of Freedom by President Ronald Reagan. In the 1980 U.S. presidential election, Sinatra supported Ronald Reagan. Reagan's victory gave Sinatra his closest relationship with the White House since the early 1960s, as a result of which Sinatra arranged Reagan's Presidential gala, as he had done for John F Kennedy, some 20 years previously. 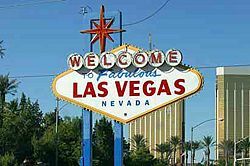 In 1980, Sinatra also decided to apply for a Nevada Gaming License, with President Reagan submitted as one of his references. In February 1981, Sinatra was quizzed by the Nevada Gaming Control Board about his relationships with Mafia figures, and his 50 percent ownership of the Cal-Neva lodge. The board eventually voted four to one to reinstate Sinatra's gaming license. Between January 22 and 25, Sinatra played to frenzied crowds at the Rio Palace in Rio de Janeiro. Still in Rio, on January 26, he played to a then world-record crowd of 175,000 at the Estádio do Maracanã. In June, he returned to Carnegie Hall for a two-week long engagement. Tickets sold out in a single day, breaking all previous box-office records at the 90-year-old venue. In 1980, Sinatra's first album in six years was released, Trilogy: Past Present Future, a highly ambitious triple album that found Sinatra recording songs from the past (pre-rock era) and present (rock era and contemporary) that he had overlooked during his career, while "The Future" was a free-form suite of new songs linked, a la musical theater, by a theme, in this case, Sinatra pondering over the future. The album garnered six Grammy nominations, winning for best-liner notes, and peaked at a more than respectable number 17 on Billboard's album chart, while spawning yet another song that would become a signature tune, "Theme from New York, New York" as well as Sinatra's much-lauded (second) recording of George Harrison's Something. 1990 saw Sinatra celebrate his 75th birthday with a national tour, and he was awarded the second Ella Award by the Los-Angeles-based Society of Singers. At the award ceremony, he performed for the final time with Ella Fitzgerald. In November 1992, the CBS miniseries Sinatra, produced by Tina Sinatra and Warner Bros., was broadcast with the full cooperation and involvement of the Sinatra family. 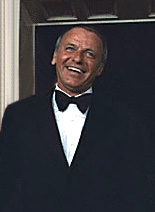 Still touring, despite various health problems, Sinatra would remain a top concert attraction on a global scale during the first half of the 1990s. At times, his memory seemed to fail him, but this was something that was exaggerated by the tabloids, while a fall on stage in 1994 was a bad sign and an indication that the end may well be near. Sinatra was awarded the Lifetime Achievement Award at the 1994 Grammy Awards. To mark Sinatra's eightieth birthday in 1995, The Empire State Building glowed blue. A star-studded birthday tribute at the Shrine Auditorium in Los Angeles would be his last televised appearance, and with the death of Dean Martin a few days later, Sinatra entered a period of seclusion and health difficulties, suffering both a mild heart attack and stroke in November 1996, and a heart attack in January 1997. In 1997, Sinatra was awarded with the United States Congressional Gold Medal. Unable to attend the ceremony himself due to his failing health, daughter Nancy Sinatra accepted the award on his behalf, saying "It's more than just an honor from his country, as far as I'm concerned, it's like the country saying `OK, Frank, we know the truth and we love you.'" After suffering another heart attack, Frank Sinatra died at 10:50 p.m. on May 14, 1998, at the Cedars-Sinai Medical Center with wife Barbara and daughter Nancy by his side. Sinatra's final words were, "I'm losing." He was 82. On May 20, 1998, at the Church of the Good Shepherd in Beverly Hills, Sinatra's funeral was held in front of 400 mourners. The words, "The Best Is Yet to Come" are imprinted on his tombstone. Sinatra made a point of studying Tommy Dorsey's trombone playing as a means of cultivating a more free-flowing vocal style; he noticed that Dorsey used a tiny air hole at the side of his mouth to sneak breaths when playing. Sinatra would employ a similar technique, and so be able to hold notes for incredibly long durations. In addition to this, Sinatra began jogging, then swimming underwater, to develop his lung capacity, which enabled him to continue a musical phrase through a stanza without pausing, or breaking the note, for breath. His legato-style of singing/phrasing took pop singing in new directions when most singers of the 1940s were keen on emulating Bing Crosby. Sinatra also possessed an outstanding vocal range, his early recordings found him singing in near-tenor range, hitting a high F on "All or Nothing At All" (1939) or "Where's My Bess," while being equally adept in the lower register, the low E, on his 1962 recording of "Ol' Man River" being a prime example of such. His phrasing was also impeccable, getting to the heart of a song by emphasizing words and lines in ways that made a song more personal, while his ability to hold notes, sing above or behind the beat, and rest on a note were hallmarks of a singer fully in command of his instrument. Sinatra's star for music on the Hollywood Walk of Fame. As a song-stylist, Sinatra's jazz-infused approach to singing seemed to occur with the end of the "Big Band" era and ushering in of an era that favored the vocalist and made him/her the focus, instead of the band-leader and his band. Frank Sinatra's voice is pop music history. […] Like Presley and Dylan—the only other white male American singers since 1940 whose popularity, influence, and mythic force have been comparable—Sinatra will last indefinitely. He virtually invented modern pop song phrasing. Sinatra's vocal style represented a significant departure from the crooning style of his idol, Bing Crosby. Sinatra's generation represented the first generation of children that had grown up in the era of the microphone, and the amplification of sound enabled singers to sing in a much softer, personal, and nuanced style. He left an amazing collection of recorded music to which singers in many genres look for inspiration today. As an actor, he proved himself in a wide array of memorable films, from musicals, to suspense thrillers, to serious dramas, several of them true classics. Sinatra! The Complete Guide. SinatraGuide.com . Obituary, NY Times, May 16, 1998 Frank Sinatra Dies at 82; Matchless Stylist of Pop. www.nytimes.com. This page was last modified on 26 April 2017, at 15:29.